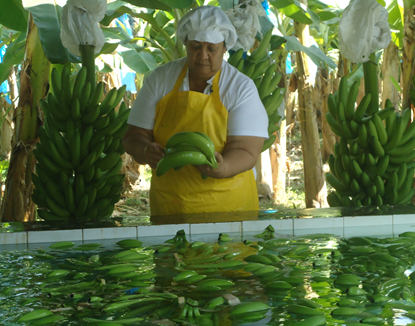 Aimeth grows bananas on her small farm of 1.3 hectares which produces around 67 boxes (1.2 tonnes) of bananas a week. She has also been employed by ASOBANARCOOP for 26 years, using her skills as a trained economist with extensive knowledge of Quality Management Systems (QMS) and extensive experience in business management. Aimeth has risen from head of administration to manager of the co-operative where her role includes ensuring the organisation continues to meet Fairtrade and GlobalGap certification standards. Aimeth is a member of the Education Committee which organises various training programmes funded by the Fairtrade Premium. As a member of her co-operative’s education committee, Aimeth works directly with Fairtrade on health issues, environmental workshops and programmes aimed specifically at the elderly and children.